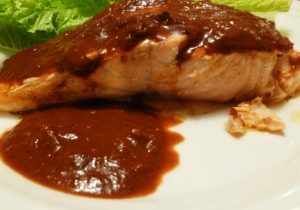 Mole Grilled Salmon Barbacoa is a recipe for salmon steaks or fillets, marinated in Larry’s Southwestern Mole Sauce and cooked on the backyard barbecue grill or under the broiler. The flavor of the slightly oily salmon combines well with the dark rich Mole Sauce making this your go-to fish on the grill recipe. Place the salmon in a shallow baking dish or pan. Season with the salt and pepper. Pour 1 cup of Larry's Southwestern Mole Sauce over the fish. Cover with foil and marinate in the refrigerator for 15 to 30 minutes. Prepare your barbecue grill or broiler for medium heat. Clean the grill and brush it with the vegetable oil. For the broiler, lay a sheet of foil on the broiler pan and brush with the vegetable oil. Place the salmon pieces on the grill or broiler pan and cook 3 to 5 minutes per side, basting with the marinade. Remove the salmon from the grill or broiler and plate. Heat the remaining mole sauce from the jar and serve on the side.